If your dream involves eating large quantities of fluffy, delicious, gourmet doughnuts, I spent Friday morning living the dream. 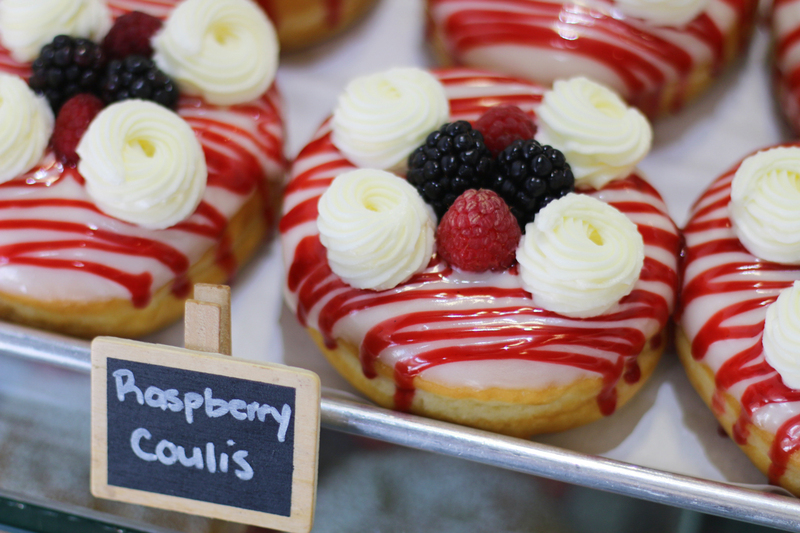 I had the chance to catch up with Karen Muirhead, owner of Honeybee Doughnuts and talk all things yummy. 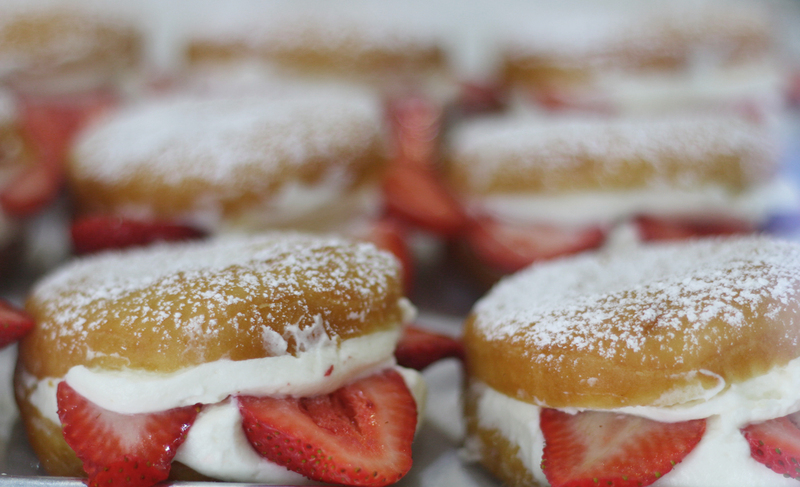 Karen is the mastermind behind the best doughnuts in Miami. Honeybee Doughnuts are my favorite donuts in town; and I’m happy to prove any challengers otherwise. 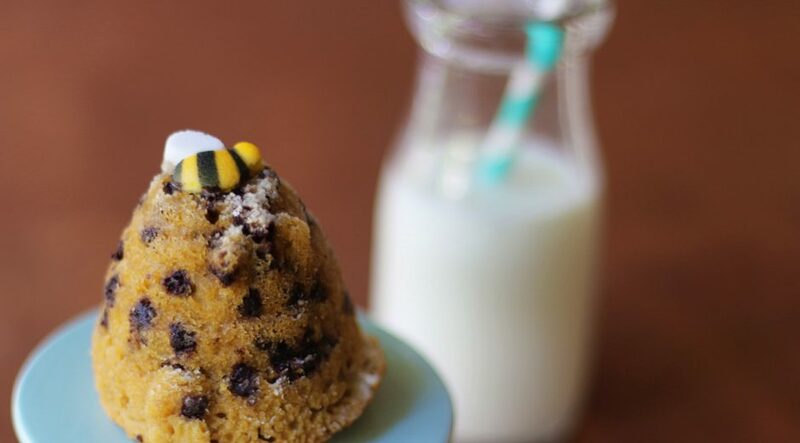 Growing up in an Northern Italian family, Karen helped cook family meals from scratch and developed a knack for preparing delicious desserts, baked goods, and even ice cream. She learned to cook from helping her mother and grandmother – both gourmet cooks. Fast forward to Karen as an adult with a high-powered job in the corporate world and a family. After making thousands of cookies, brownies, and breads for her kids’ fundraisers she decided to quit her job and open a doughnut shop. Knowing the process of bread-making allowed her to discover the secret to her delicious, and perfect doughnut batter recipe: the heart of Honeybee Doughnuts. 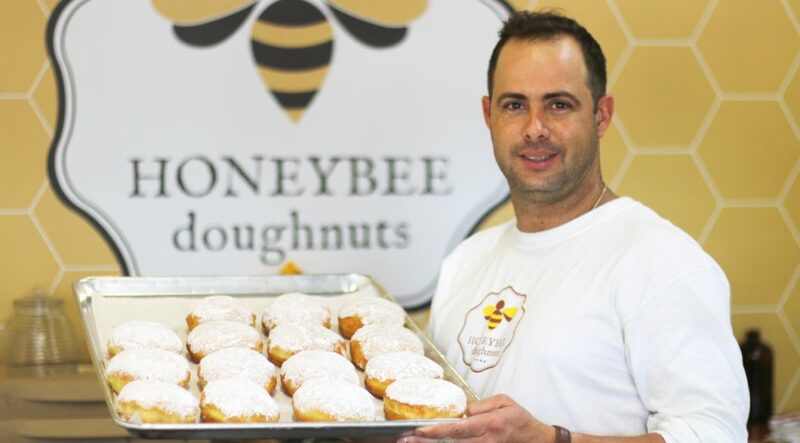 Honeybee Doughnuts opened it’s doors little over a year ago; and it has already won the hearts and bellies of South Florida residents. 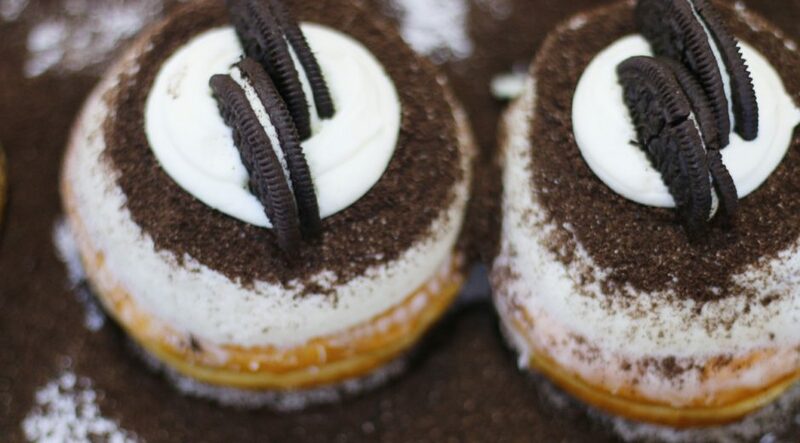 Their South Miami location is a non-stop current of customers walking in empty-handed and walking out with beaming smiles and doughnuts. 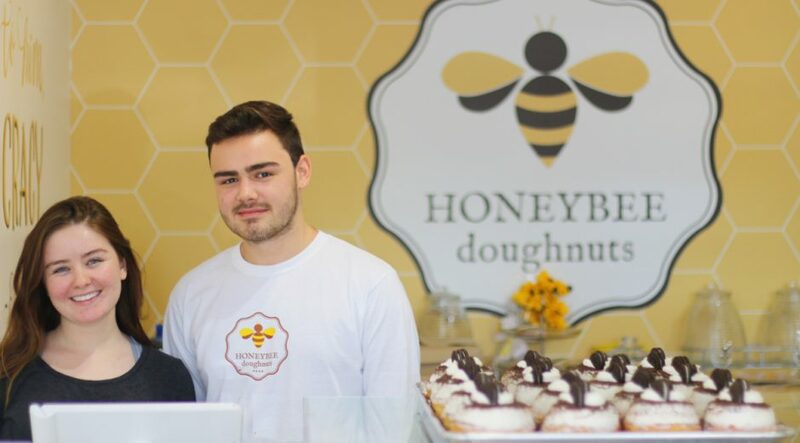 Customers drive long distances to get their Honeybee fix, like couple Brittni and Nathan Revell who drove from Ft. Lauderdale to grab a dozen Honeybee Doughnuts. 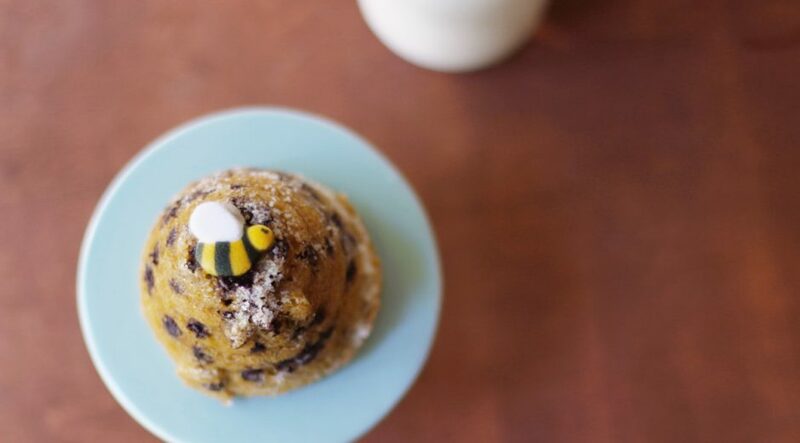 Honeybee’s success reaches outside their South Miami location. 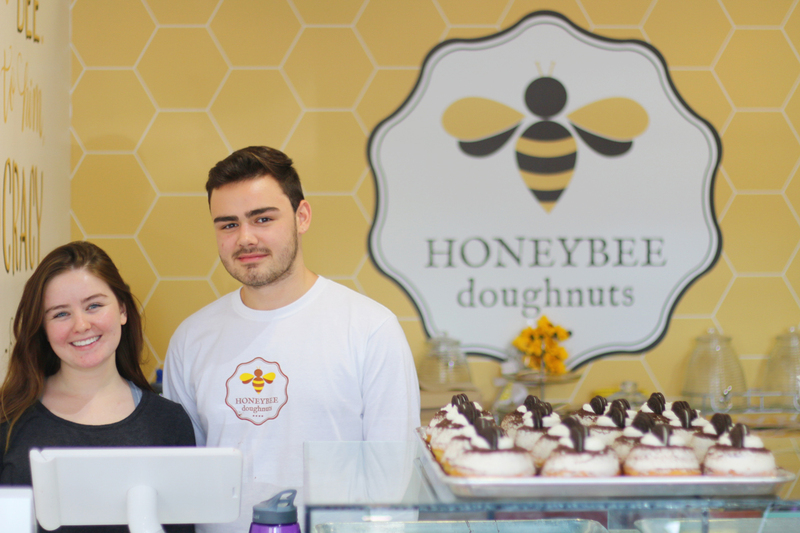 You can also find Honeybee Doughnuts at every Panther Coffee location, and Sloan’s Ice Cream stores (one just opened in Doral). 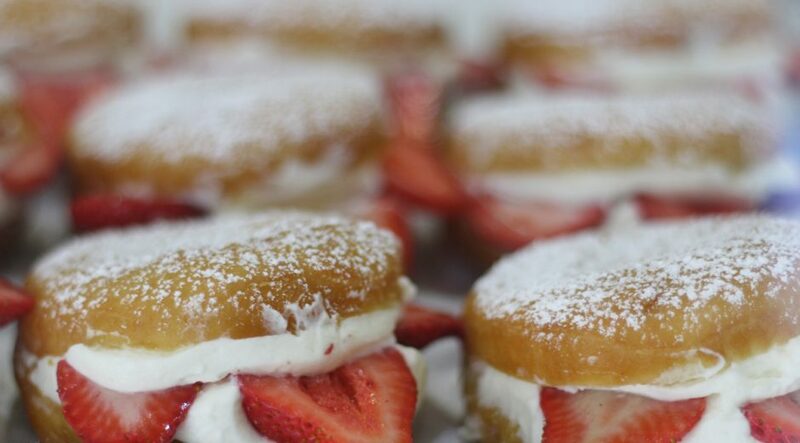 They’ve participated in the South Beach Wine and Food Festival; and will be competing on the TV show Dessert Wars on The Food Network. 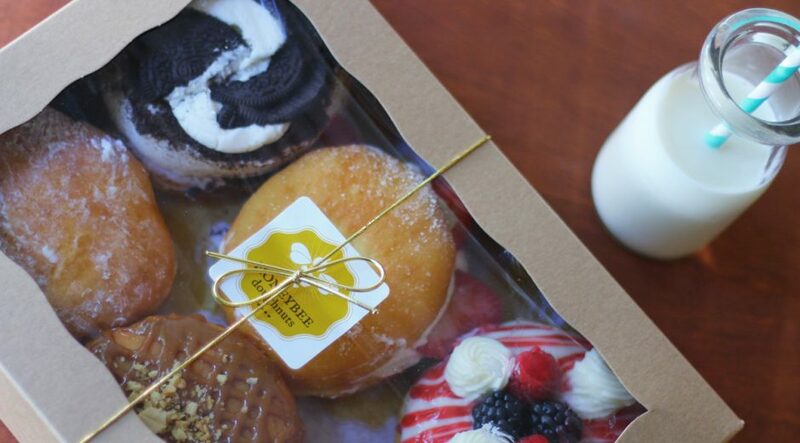 I’ll be tuning in to root for team Honeybee Doughnuts, for sure! 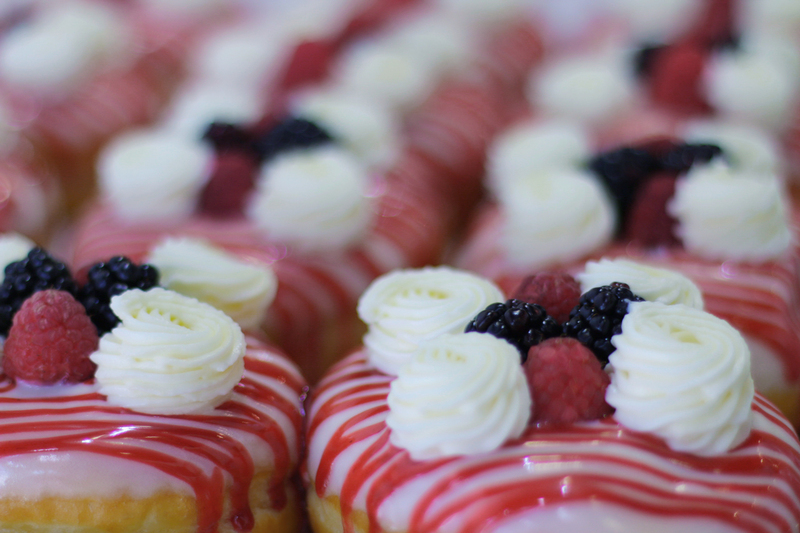 What makes Honeybee Doughnuts the bee’s knees? 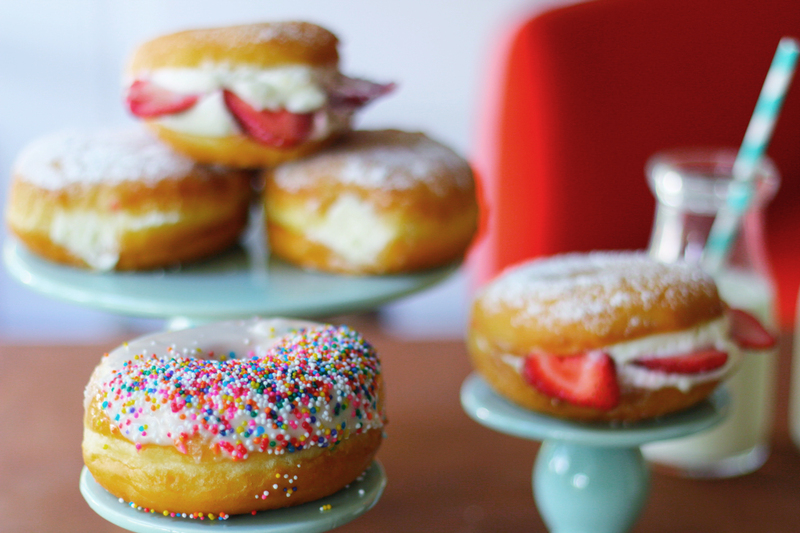 The doughnuts are enormous, fluffy, and moist yet not oily. They use the best ingredients and are doing it right. 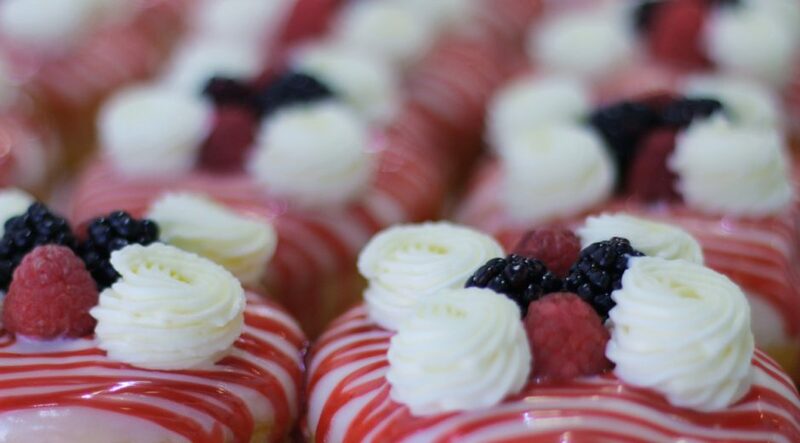 Karen has an entire team dedicated to decorating her delicious creations into beautiful goodies almost too good to eat – almost. Let’s be real. 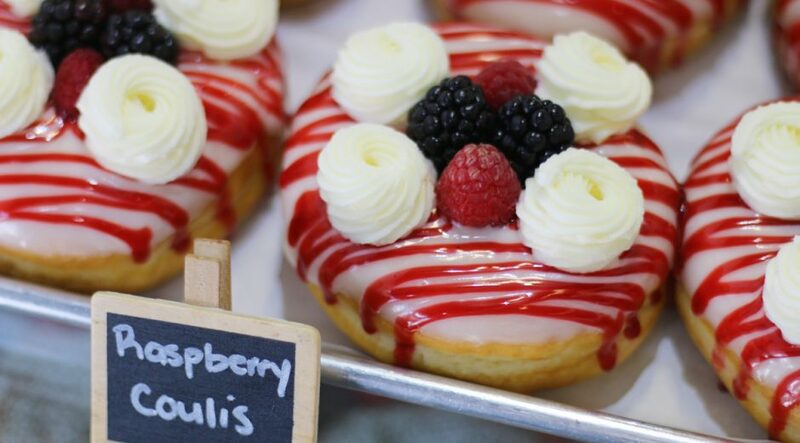 Every doughnut they make is amazing. The available flavors vary everyday and the best way to find out what’s on the menu is to follow their Instagram Stories. Nonetheless, let me recommend some must-have flavors for you. 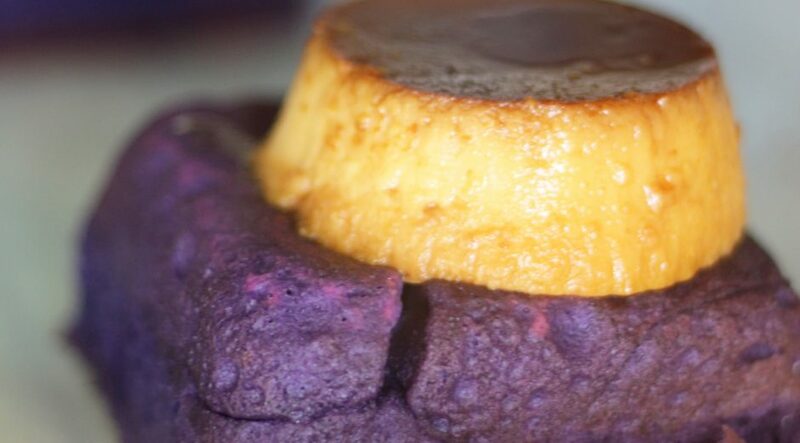 Their latest seasonal hit is their Ube Cake Doughnut with Flan de Queso. Ube is a Filipino delicacy. It’s a purple root similar to a yuca. 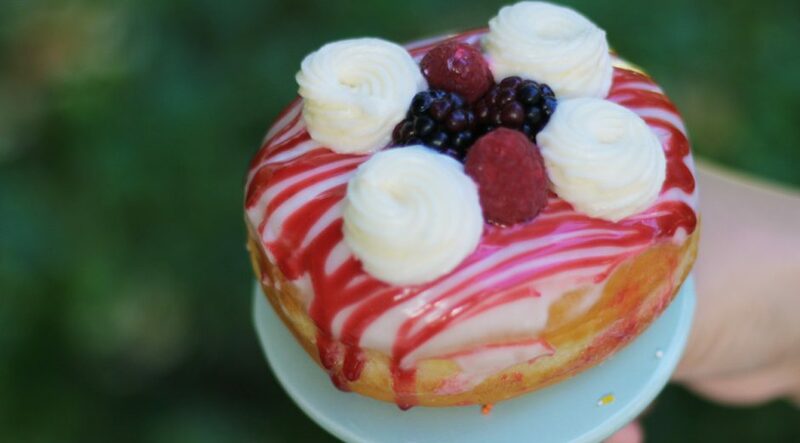 Karen used powdered Ube to add exotic hints of coconut to the cake doughnut and added a scrumptious flan on top. 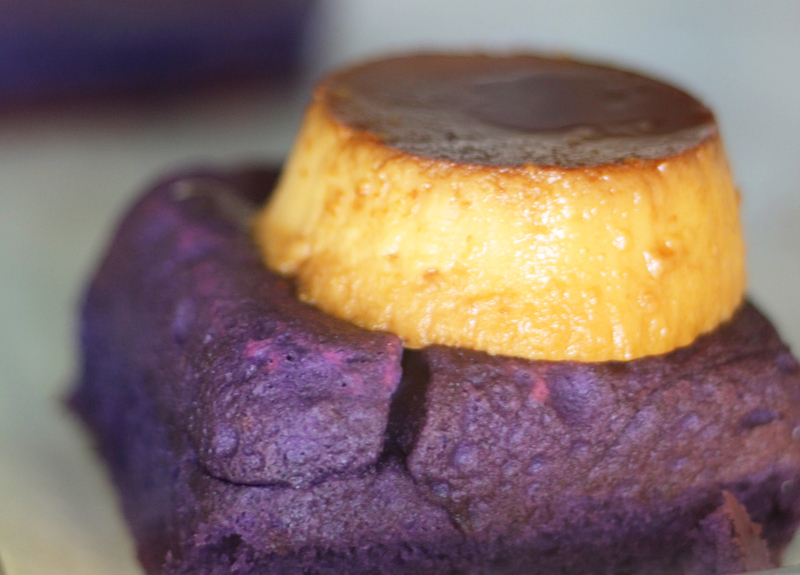 The flan’s smooth cheese profile combined with the coconut Ube flavors make an incredible doughnut. 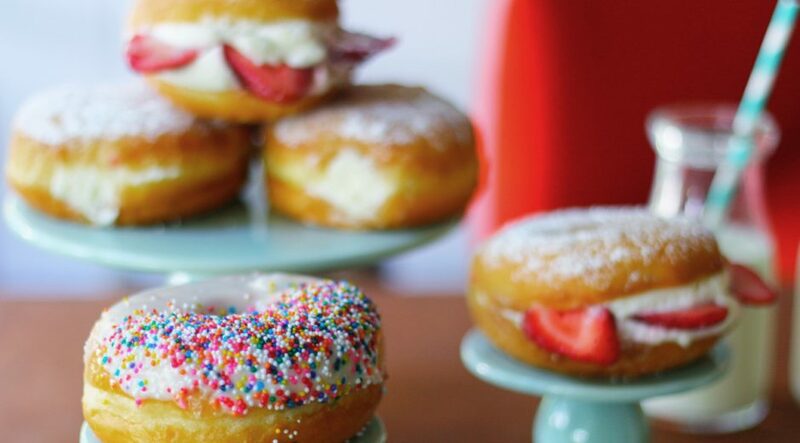 The doughnut cake is so soft and moist, it melts in your mouth. 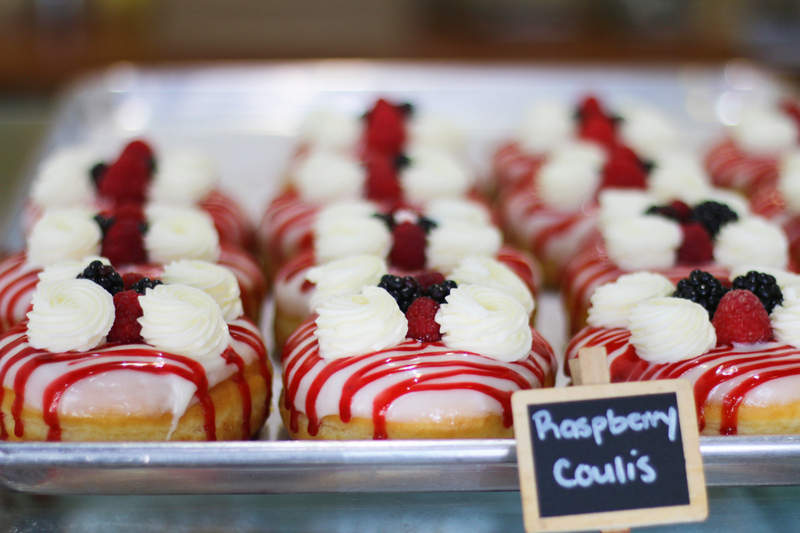 Opting for the purple doughnut might not be your first choice, but you need to try this. 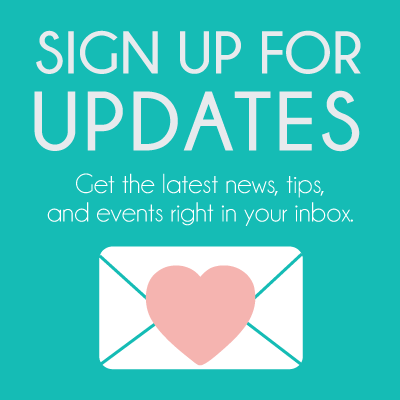 It will change your world – for the better. Trust me. My favorite flavor is the classic Honeybee Doughnut. 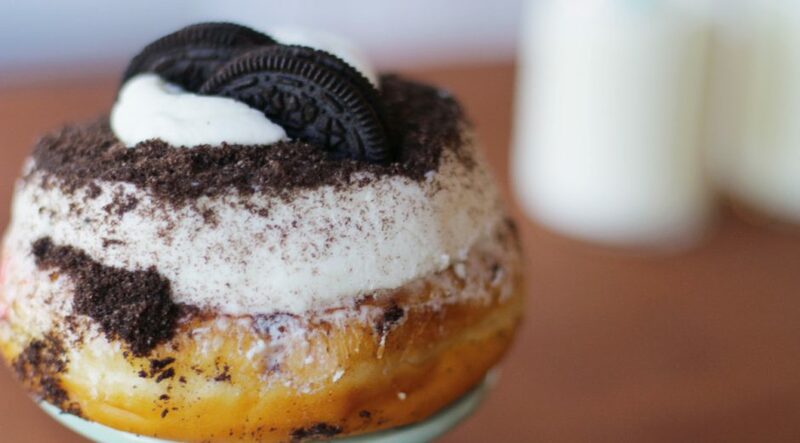 This doughnut is filled with whip cream and honey. It’s simple, but their fresh ingredients taste like heaven. I always get this one when I visit. Dulce de Leche is a fluffly donut filled with dulce de leche it’s drizzled with more dulce de leche on top and sprinkled with nuts. 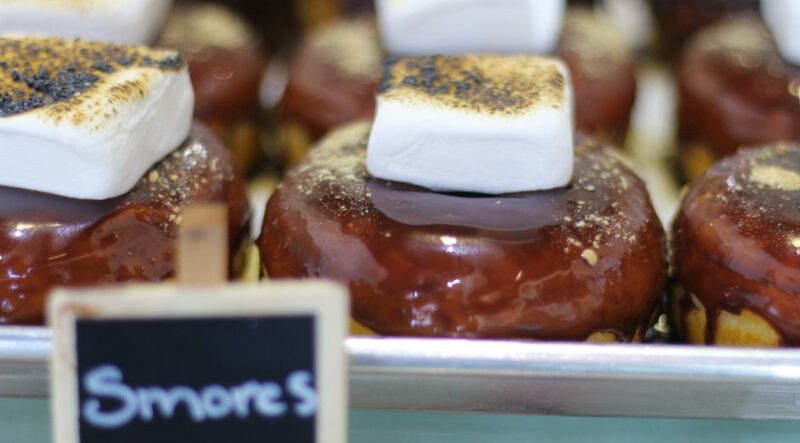 The fluffy donut, the sweet caramel flavors and the savory donut bites make a glorious sweet and salty donut. 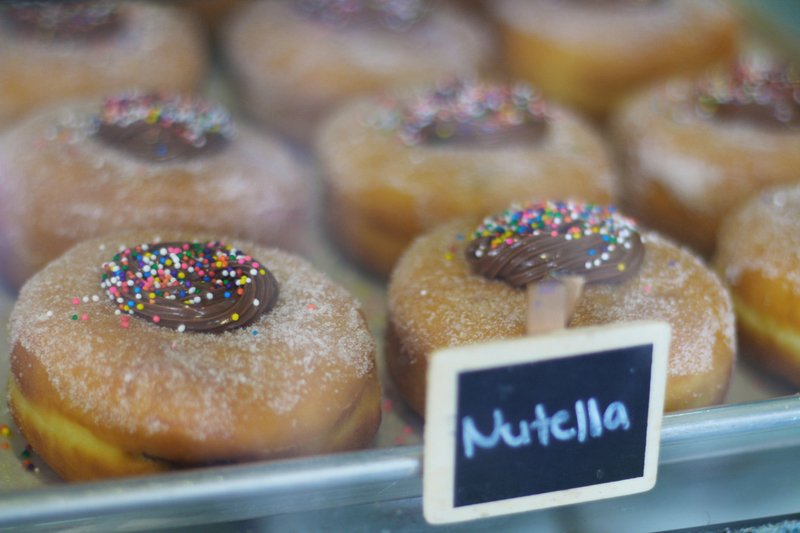 Nutella is a fluffy donut filled with Nutella. 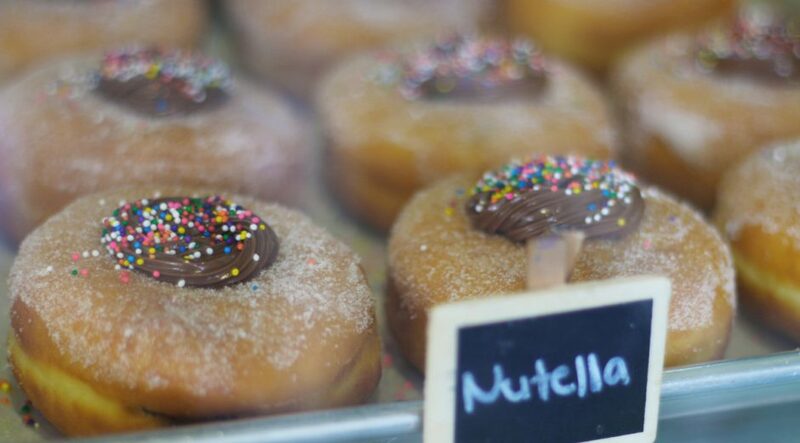 This is a no brainer for Nutella lovers. 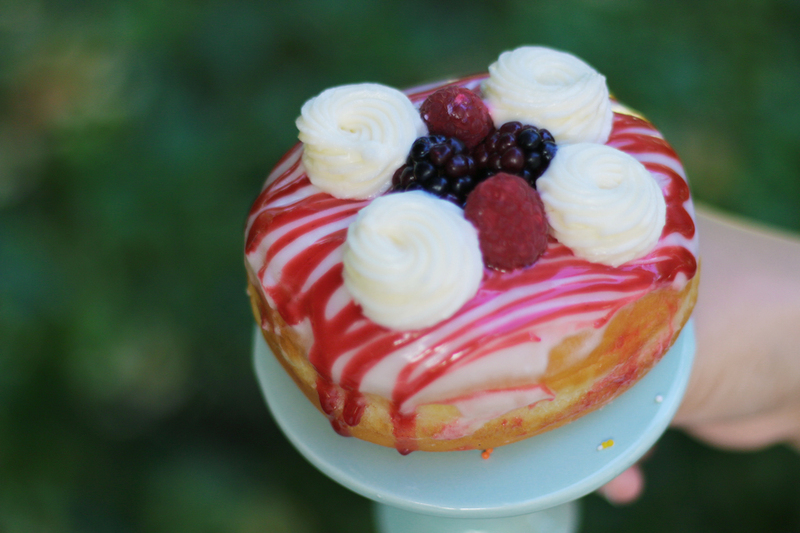 Raspberry Coulie is a beautiful donut topped with raspberries and blackberries drizzled with jelly and touches of whip cream. 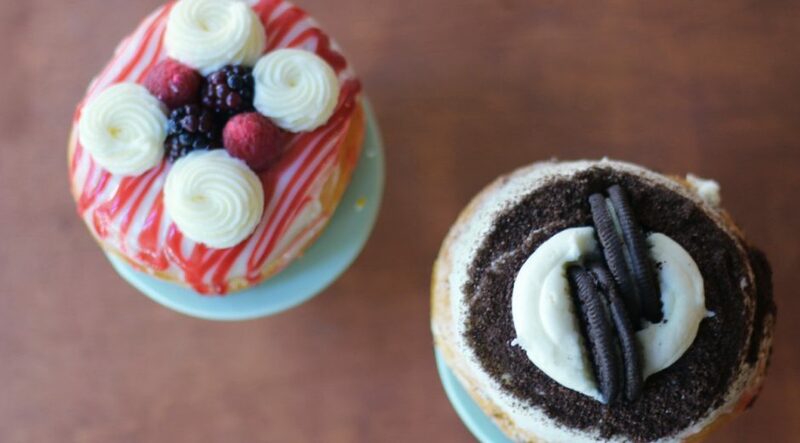 It’s almost to pretty to eat; but you’ll eat it. It’s fruity and delicious. 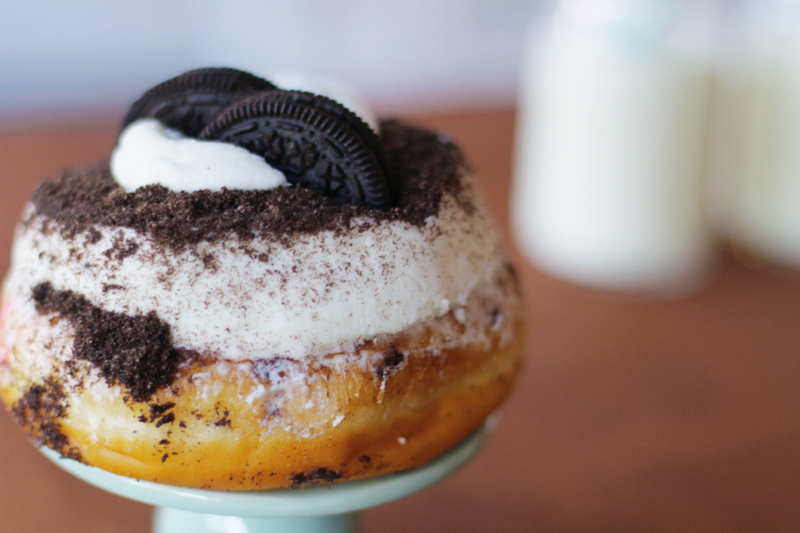 Their Oreo donut is a decadent donut topped with whipped icing and Oreo cookie crumbs. 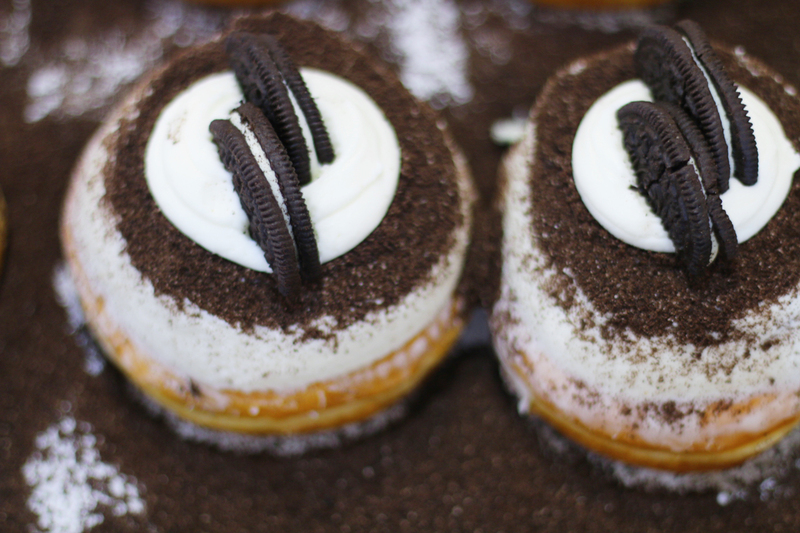 Decorated with even more Oreos. It’s a massive cookies and cream delicacy. Happy Birthday would be Homer Simpson’s first pick. 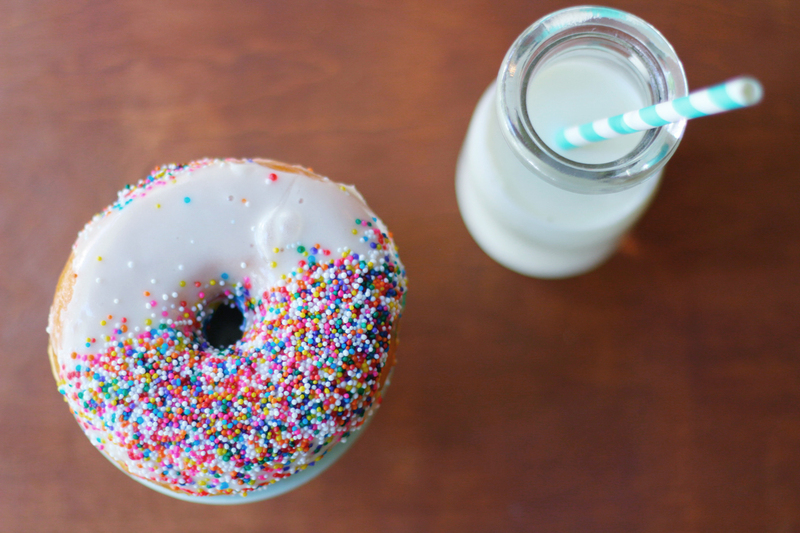 The classic sprinkles doughnut – except the doughnut is from Honeybee so it’s enormous, fluffy, and incredibly tasty. 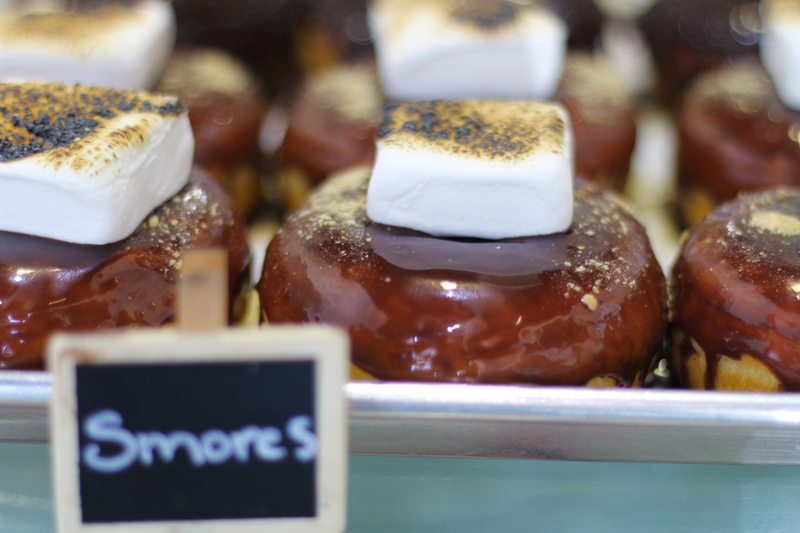 S’mores is a chocolate doughnut topped with a giant roasted marshmallow and graham cracker crumbles. 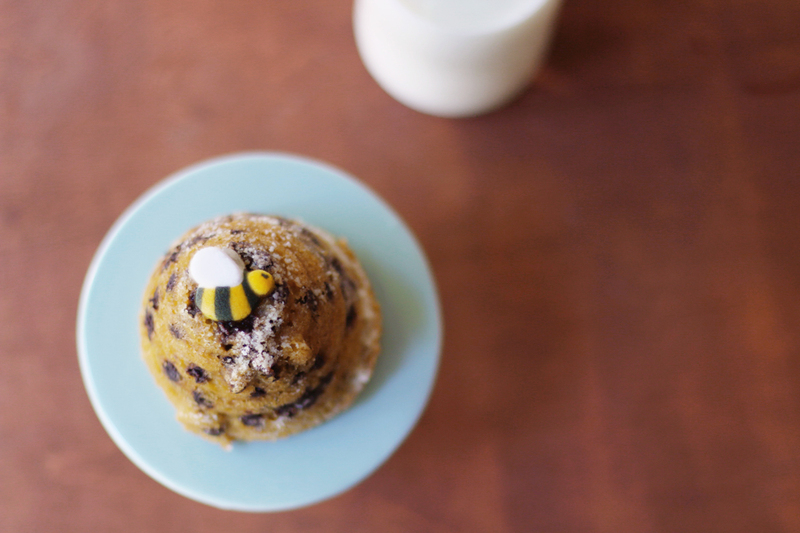 Honeybee makes gluten-free bakes goods called Beehives. 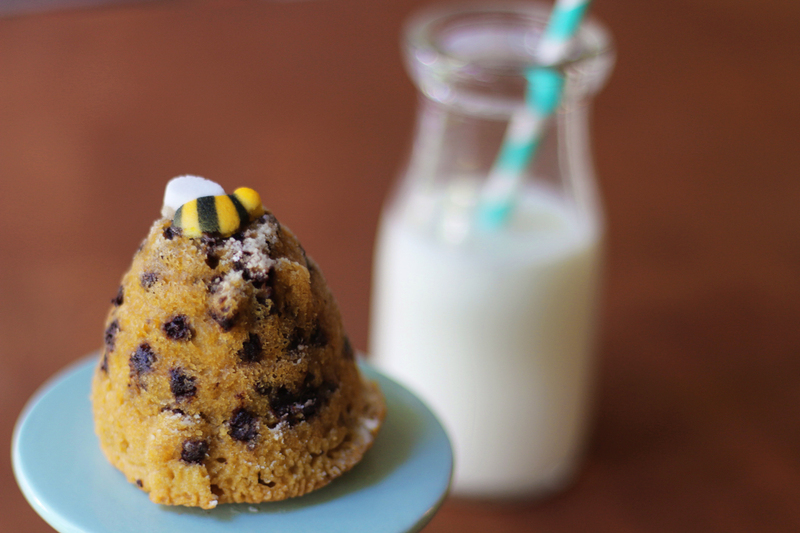 They look like an upside down cupcake, are baked with rice flour, and packed with protein. 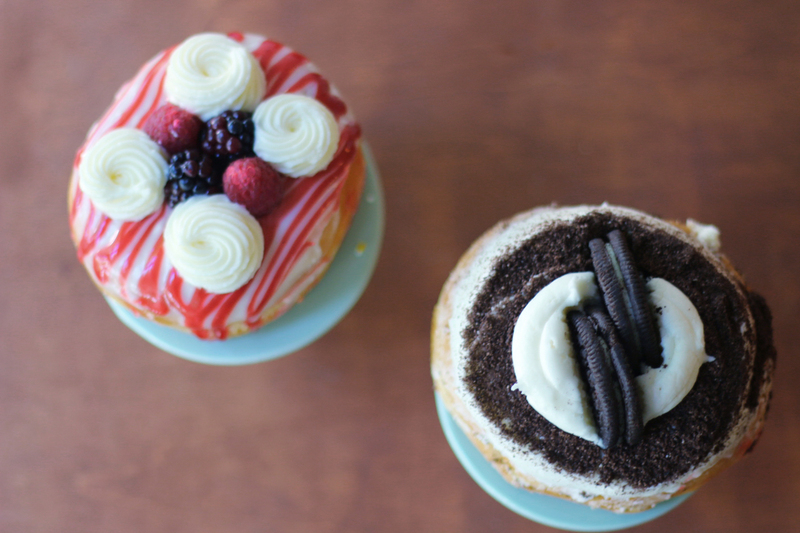 These yummy little guys range from 90-110 calories depending on the flavor: vanilla, chocolate chip, matcha, and blueberry. These popular treats sell out everyday. Make sure to stop by early and grab yours before they’re gone. Karen is all about creating a welcoming, cozy vibe that makes you feel right at home. She’s also all about supporting other local businesses via collaborations. And if you know me, you know I love myself a great collaboration! 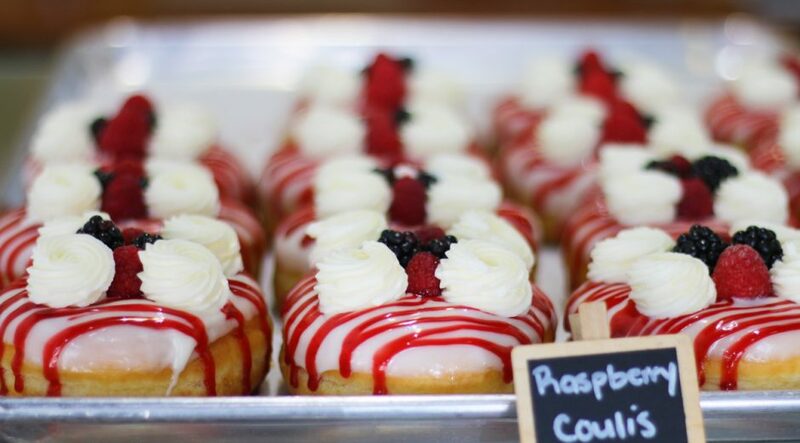 I’m happy to find Honeybee Doughnuts at Panther Coffee locations; and ordering Panther Coffee with my Honeybee Doughnuts. 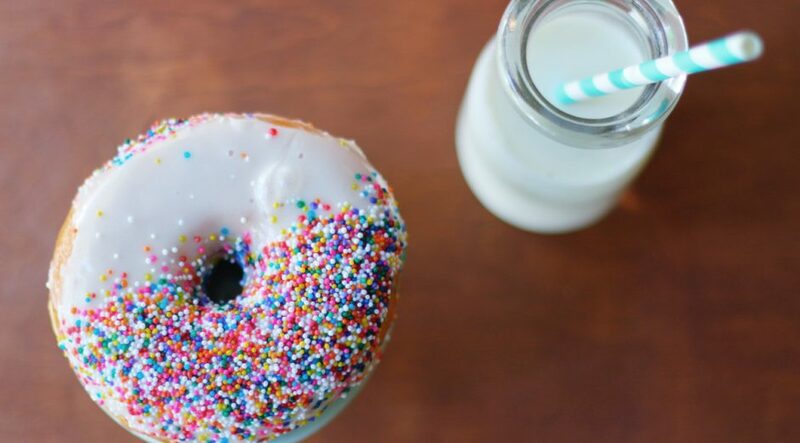 They go perfectly, like coffee and doughnuts. 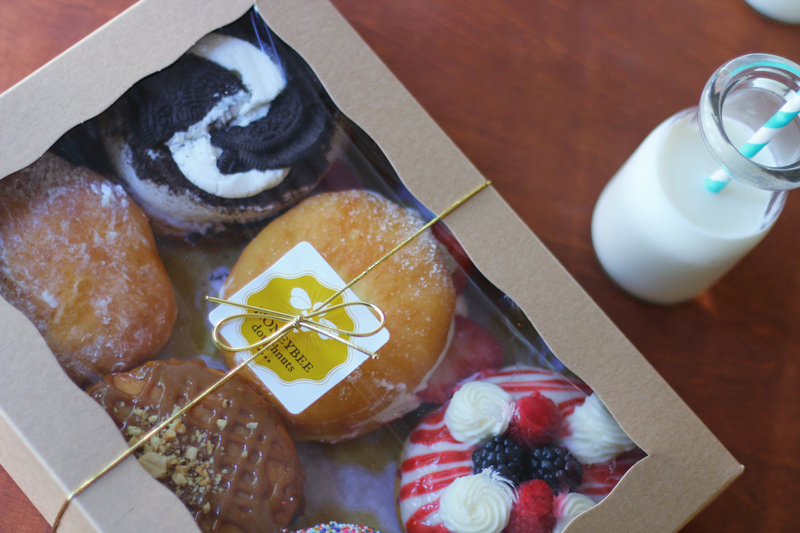 You can also order Yoko Matcha with your doughnuts – another local business.